Miss Browning was headmistress for just two years. For the first two terms she was assisted by Mrs Entwistle and later by Mrs Chandler, wife of the priest-in-charge The Rev Chandler. Miss Browning's pupils have told me that she was a softly spoken, sweet natured person who put religious instruction high on the list of subjects to be studied. 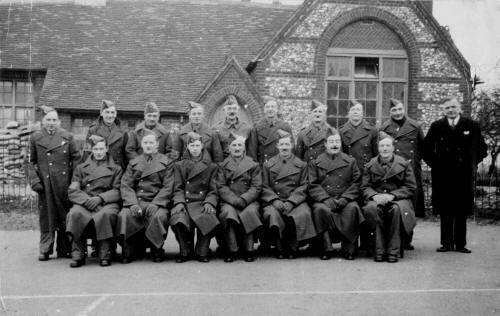 During the time the staff had good reports from the Diocesan Inspector but although Mr Hiff, HMI, visited the school in June 1943 there is no written report from him recorded. These were quite difficult years for teachers, the war was at its height, school buildings were to be used for other purposes if the need arose and, although in a Reserved Occupation, women teachers were directed to help the war effort in other ways. one of the "other purposes" to which the school was put. Jan 1942 : Representatives of the Milk Marketing Board called to arrange for milk in school. Received letter giving instructions in the event of an invasion or other emergency. Letter on the care of respirators. March 1942 : An allotment having been obtained the seven oldest boys began work on it. Miss Browning left Frieth school to take up the post of divinity teacher at Wycombe High School for girls. Probably this suited her better than teaching a mixed group including 11 to 14 year old boys.